Installed a new Asus M5A78L-M LX Plus. Running Windows 8 64 bit and, consequently the hwinfo64. HWINFO reports my 12 volt rail as 10.343V and doesn't seem to change (min, max and current all read the same). I used a multi-meter on a molex connector and got 12v at the same time that HWinfo was reporting 10.343V. Just to be sure, I also checked the BIOS and, at the time, it was reading 19.99V. That might be because HWiNFO doesn't fully support your mainboard's sensors, but it's very strange that the BIOS reports an invalid value too. To check this in detail I need the HWiNFO Report File including sensor data (and maybe the Debug File too). If the file won't attach, please pack it (ZIP, RAR, 7z, etc). Thanks for your report, you attached all required information, so I can fix this in the next build released. (12-16-2012, 05:16 PM)Martin Wrote: Thanks for your report, you attached all required information, so I can fix this in the next build released. Martin! Thank you very much for your response! I handed him Skif_off of forum.ru-board.com and together we can verify that it will see. Personally, I have such a card is not there because I would help him as his knowledge engineer. Thank you again and wish you a Happy New Year and Merry Christmas! Thanks, it's easy to fix such things when I get all required information. If there are any other users with such issues, just let them know. (12-18-2012, 08:18 AM)Martin Wrote: Thanks, it's easy to fix such things when I get all required information. If there are any other users with such issues, just let them know. Thank you so much! Now I will write about this topic in children. If chtouznayu - after validation measurements immediately tell. After all, it is something that people from inexperience did wrong and got the error of measurement that was taken for the correct answer. The new version released (v4.10) should fix the ASUS M5A99X sensors too. (12-19-2012, 02:02 PM)Martin Wrote: The new version released (v4.10) should fix the ASUS M5A99X sensors too. where is difference between "Core #x VID" and "Vcore"? 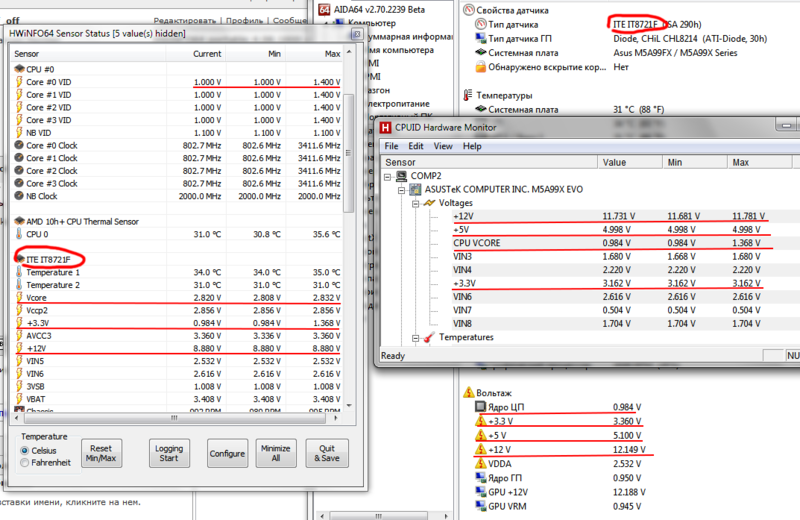 VID is the voltage requested by CPU and Vcore is the really measured voltage. There can be a difference between them in case the mainboard applies offset to the requested voltage. (11-25-2012, 09:10 AM)Martin Wrote: That might be because HWiNFO doesn't fully support your mainboard's sensors, but it's very strange that the BIOS reports an invalid value too. I will attempt to attach the report again. Thanks for the report. Unfortunately it doesn't contain the sensor data (you'd need to enable the "Log all values for Report (consumes memory)") option to have them included. Alternatively it might be sufficient if you'd attach a screenshot of the sensors window, so I can see the exact values reported. (04-23-2014, 03:55 PM)Martin Wrote: Thanks for the report. Unfortunately it doesn't contain the sensor data (you'd need to enable the "Log all values for Report (consumes memory)") option to have them included. Okay, I added the check to "Log all values for Report (consumes memory)" and re-generated the report. Hopefully the sensor info is in there (Sensor info is check in the list of things to include). 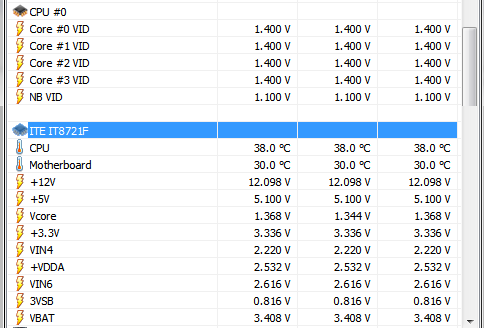 I've also added a screen shot of the sensor values (voltage section), just in case. It's in the zip pack with the log file. Thanks a million for the amazing program and for checking into this for me! Thanks, I'll fix this in the next build released. I just wanted to say that this is one of the most useful programs I've ever had the pleasure of owning. I am constantly recommending it to techs, computer guys and even home PC owners. Just an all around great program! Thanks for putting it together for us! Current time: 04-24-2019, 03:13 AM Powered By MyBB, © 2002-2019 MyBB Group.